This photo is from the lobby of the Hotel Eleganté in Colorado Springs. 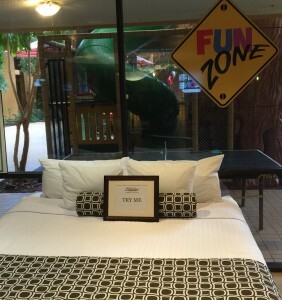 They’ve really embraced the idea of fun–in case you can’t read it, the bed has a “try me” sign on it. Interestingly, the hotel has a huge stone tablet with the ten commandments when you walk through the door, so this might be sending some sort of mixed message–or perhaps not. Your mileage may vary (as will that of many visitors to the lobby). We were in the hotel for COSine 2016, a local sci-fi convention. The guest of honor was Jim Butcher of Dresden Files (and much other) fame. He is always a fun speaker, although he seemed a bit tired. The great Connie Willis was also there. If you haven’t already, you should go out and buy all of her books right now. The other main guests were Bryan and Baxter, who are “Paranormal Claims Investigators.” I was unsure of what this meant at first, but it turns out that they are primarily researchers and debunkers of paranormal claims, and were very interesting. At some point I need to write an entry about my own time involved with such a group many, many years ago, and how I almost got murdered by the other members of the group (a hint – it will be filed in the Practical Joke category). The convention overall was fun, although it is always a bit weird for me to be at a convention and not be required to do anything. One thing that is strange about Cosine is that the Eleganté convention rooms are spread over a number of different floors, so you tend to have to use the slow and rickety elevators to move between programs. Also, speaking as a UI designer, whoever decided that having no indicator outside the elevators to indicate whether they are going up or down should be required to stand in the lobby and apologize to each individual rider..